(CNN) — Iran’s government is denying reports that an Iranian woman convicted of adultery will be executed by stoning, though her death sentence may still be carried out by some other method. In the Islamic republic’s first public statement on the case of Sakineh Mohammedie Ashtiani, 42, the Iranian Embassy in London, England, said Thursday that “this mission denies the false news aired in this respect and … according to information from the relevant judicial authorities in Iran, she will not be executed by stoning punishment. “It is notable that this kind of punishment has rarely been implemented in Iran and various means and remedies must be probed and exhausted to finally come up with such a punishment,” the embassy said. But Ashtiani still faces the possibility of execution for her 2006 adultery conviction, said Drewery Dyke of Amnesty International in London. 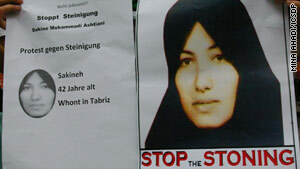 Dyke said Amnesty first heard that Ashtiani had been sentenced to death by stoning from her lawyer, Mohommad Mostafaei. Ashtiani’s son, who appealed Wednesday to Iran’s courts to spare his mother’s life, said he won’t accept any decision short of his mother’s freedom. Through human rights activist Mina Ahadi, Sajjad Mohammedie Ashtiani said he would be satisfied only when Iran’s judiciary officially drops the charges against her. Ahadi has told CNN that only an international campaign designed to pressure the Islamic regime in Tehran could save Sakineh Ashtiani’s life. “Legally, it’s all over,” said Ahadi, who heads the International Committee Against Stoning and the Death Penalty, earlier this week. Ashtiani’s son wrote in an open letter to government officials that there was neither evidence nor legal grounds for his mother’s conviction and sentence. He said the family has traveled six times from their home in Tabriz to Tehran to speak with Iranian officials, but in vain. “So I have no option but reaching out to them this way,” he said earlier in the week.